From fear to optimism, many varying views were given to reporter Kerri Stevenson when she sounded them out about Trump’s election victory. People in Leicester say they are shocked buy not surprised by Trump’s victory at the polls. 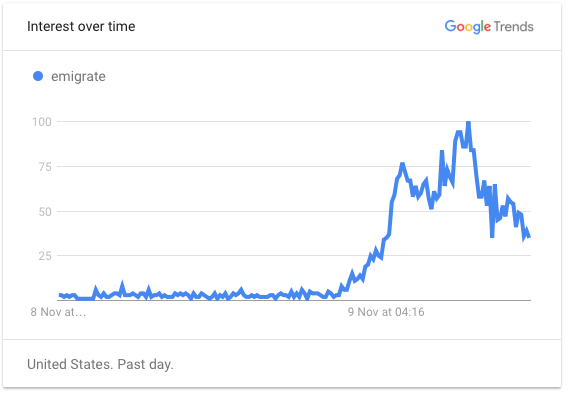 Google analytics show huge rise in number of Americans searching the term ’emigrate’ as Trump snatches Presidency. Head of M15 seen entering 10 Downing Street through back door, but ’emergency meeting’ claim dismissed as ‘nonsense’. 10.12am (UK): What do you think? Leicestershire Press reporters are out on the streets finding out what citizens think of the US election result. Watch this space. Trump won support of 48% of popular vote in a narrow victory over Hillary Clinton who took 47%, according to BBC News. The Guardian newspaper reports protest marches in several US cities in response to Donald Trump’s victory. Shares on the London Stock Exchange FTSE100 index opened down 140 points before bouncing back during Trump victory speech. Trump’s vow to “Take America back” has echoes of Brexit in the UK, or “Brexit Plus, Plus, Plus” as the Republican candidate predicted in his final speech of the campaign. “We will start renewing the American Dream,” he tells supporters. Some US media organisations have now declared Donald Trump will be the winner of the US Presidential election even though not all states have declared their results yet. It’s not all over yet with the results in key states such as Pennsylvania, New Hampshire, Michigan and Arizona still to be called. Those are now states which have to go Clinton’s way if she is to have any chance of victory. But Trump leads by 248 to Clinton’s 218 as both search for the elusive 270 mark. Trump leads the Presidential race holding 244 electoral college votes to Hillary Clinton’s 217 with the results called in 43 of the USA’s 50 states. He needs to reach the total of 270 to claim outright victory and there are still several key states which are too close to call with the final votes still being counted.